Introduction:Flexible cystoscopy is routinely performed by urologists as an outpatient procedure. The use of a disposable sheath can increase the cystoscope lifespan and reduce costs related to reprocessing. 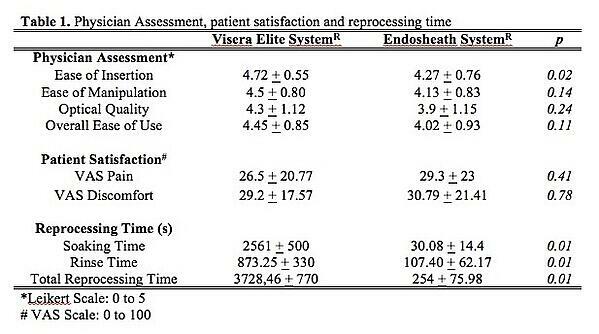 The aim of this study was to compare the Endosheath Technology with the Visera Elite System for the following parameters: urinary tract infection (UTI), patient satisfaction, physician assessment and cost-effectiveness. This is a prospective, randomized, single center clinical trial (IRB#00036203) performed in patients referred for cystoscopy. Patients with UTI, chronic pelvic pain, urethral strictures were excluded. 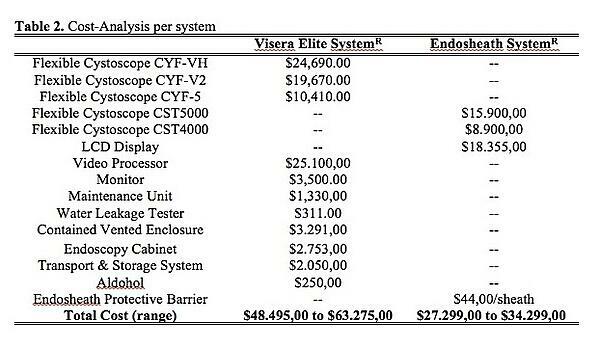 Urinalysis/culture were collected before and 14 days after cystoscopy using Visera Elite System (Olympus) or Endosheath System (Cogentix). After cystoscopy they filled a Visual Analog Scale (VAS) for pain/discomfort. Physicians filled 5-point Likert scales for the following elements: ease of insertion, manipulation, optical quality and overall use. The reprocessing time, cost analysis, which means staff-cost associated with reprocessing & retail-price per system, were compared. Results:Out of 74 patients enrolled, 40 completed the 2-weeks study; 20 underwent cystoscopy with Visera Elite System and 20 with Endosheath. There were 2 positive cultures at 14 days follow up in the Visera System. 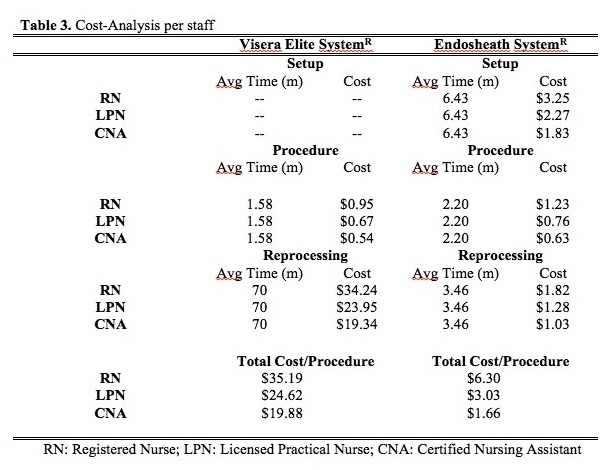 VAS, physicians assessment and reprocessing time data are shown in Table 1. The cost analysis are presented in Tables 2 and 3. There was no increase in the risk of infection using the Endosheath System. It has a lower cost and reprocessing time. Regarding patient VAS and physician subjective assessment there was no difference in a comparative analysis.